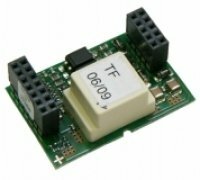 RS-485-N is a module for remote communication between multiple Sunny Boy Inverter(s) and Sunny WebBox or 3rd party monitoring system. A 4-conductor cable required between inverters. RS-485 cable is required between one inverter and Sunny WebBox. One module is required for each inverter. The RS485 Piggy-Back is compatible with the SMA Sunny Island inverters. It is required to communicate with the SMA Sunny WebBox for system monitoring, remote diagnosis, data storage and visualization. The RS 485 communication system is for those situations where a power line carrier won't work. When you have to link not just several inverters, but several Sunny Boy Controls, RS 485 is the tool to use. Sunny Boy Interface RS485 communication between multiple Sunny Boy Or Sunny Island Inverters and a PC using an Integrity Instruments RS-485 to RS-232 converter.